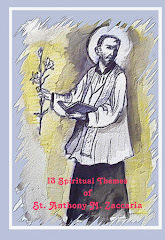 Saint Anthony Mary Zaccaria: My personal Reflection .. Without doubt it was Thomas Merton’s book entitled, No Man is an Island, which made John Donne’s expression so noted among general population. This insightful statement carries within itself a lesson to be learned for each of us, just as it was in my case while working on a project that I undertook. 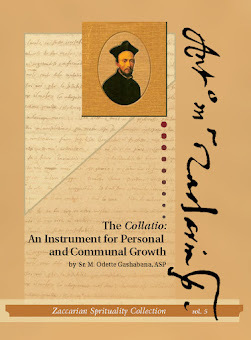 It all started almost a year ago, in June 2008, when I was searching for the homily that Pope Leo XIII made during the canonization of our Holy Founder, St. Anthony Mary Zaccaria. I contacted my confrere, Fr. Filippo M. Lovison, CRSP who was stationed in Rome, for some direction on this matter. It was during my conversation with Fr. Lovison that I had learned about the Bull of Canonization of St. Anthony by the Supreme Pontiff, Leo XIII, entitled, Dilectus Domini nostri, and dated May 27, 1897. This was truly a great blessing and was an answer to my search. 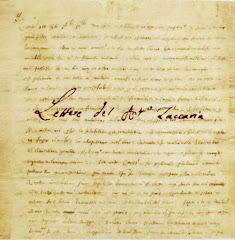 However, the document was in the original language, in Latin. So then, I began to look for the person to help me with the translation. I communicated with our Provincial Superior in the North-American Province, Fr. Gabriel M. Patil, CRSP and asked for his assistance. Fr. Patil in turn took upon himself the task to contact our confrere, Bishop Sergio Pagano, CRSP who is at present the Prefect of the Vatican Secret Archives, and requested him to have the document translated into English. Fr. Patil and I were also one in asking Bishop Pagano to write the preface to the Bull, owing to his expertise and his position as prefect. Bishop Pagano accepted our requests. Regarding the translation, we learned that the search for a translator of the document had become a real hurdle almost impossible to overcome. In the final account, the document was translated only into Italian and not into English, as it was originally intended. And so the search for a translator continued. Finally, Fr. Robert F. Slesinki, a friend of mine, who is in Connecticut, USA, agreed to translate the document into English. At this time there was a need for the final work of editing and correcting the document. For this delicate and vital task to the final presentation of the Bull of Canonization to be accomplished, I turned to my friend in the Philippines, an Angelic Sister, Sr. Rorivic Israel. Her editorial work was one of the final touches given to the final form of the document. Now I was left only with finding the person who would creatively and originally provide a graphic form to the document. Mr. Greg Gambino, who is another friend of mine, and who is a graphic designer, did the job, and did it excellently. These people became instrumental to the completion of the project. From my experience of working with them, I have realized that any endeavor must be done with others. Indeed, no man is an island. I could have not accomplished this project had I done it all by myself. To all of them, I am deeply grateful.